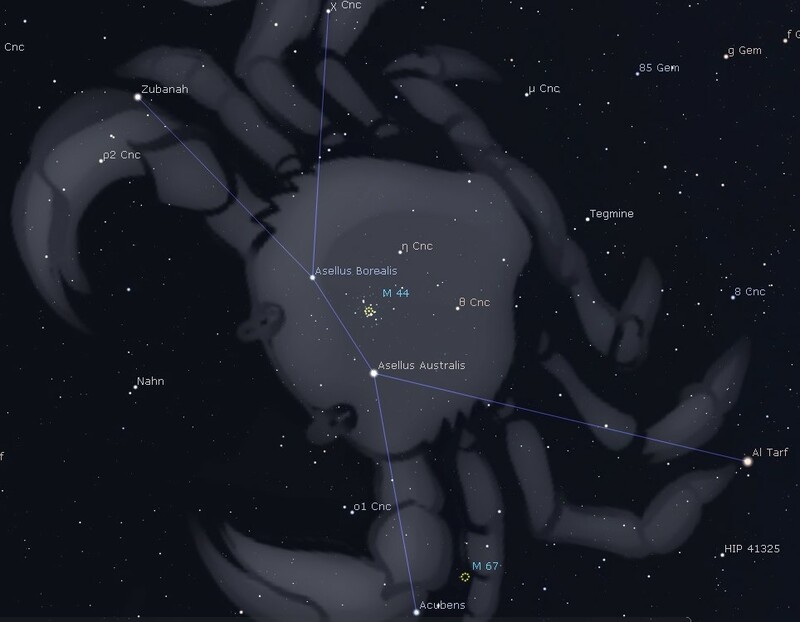 The most inconspicuous of the zodiac constellations is faint Cancer the Crab, which is nestled between Gemini and Leo. In mythology, the crab was sent by the goddess queen Hera to distract Hercules while he was battling the Hydra. The crab was no match for the strongman’s stomp. Ancient Egyptians saw it as their sacred dung beetle, the scarab. In the first millennium BC the Sun was in Cancer at the summer solstice, the time when it halts its northward motion and slowly starts heading south. This back and forth motion of the rising and setting Sun on the horizon was perhaps reminiscent of a crab sidling on a beach. The constellation is recognized by a trapezoid of dim but naked eye stars as the crab’s body, with other stars representing the claws and legs. The trapezoid was also seen as a manger flanked by a pair of donkeys, Asellus Borealis and Asellus Australus. On a clear dark night we can see a hazy patch of hay within the manger, and binoculars reveal it as a beautiful star cluster called the Beehive, Praesepe (manger) or M44. Being near the ecliptic, the Moon and planets often pass through or near this cluster. The Beehive was once used to forecast storms, for if it could not be seen it was hidden by light clouds at the front of a weather system. Binoculars reveal another star cluster, M67, less than a fist-width south of M44. Around midnight on Christmas Eve the Moon is near Praesepe. This will make it difficult to see the hay in the manger as moonlight washes out the stars. Perhaps the Moon is an ox joining the donkeys to eat the hay. Magic, or Magi? Saturday’s sunrise in Moncton is at 7:58 am and sunset will occur at 4:36 pm, giving 8 hours, 38 minutes of daylight (8:00 am and 4:44 pm in Saint John). Next Saturday the Sun will rise at 8:01 am and set at 4:41 pm, giving 8 hours, 40 minutes of daylight (8:03 am and 4:49 pm in Saint John). The Moon is full on Saturday, the Long Night Moon or the Mi’mgaw Chief Moon, and it approaches the Beehive star cluster on Monday evening. Mercury is two degrees left of Jupiter on Saturday morning and they appear within the same binocular view until Boxing Day, with Mercury heading sunward. Venus rules the morning sky to their upper right. Mars is at its highest in the south at 6 pm while Saturn is too low in the west at sunset for observing. Comet 46P/Wirtanen passes below Capella, the sixth brightest star, on Sunday evening. It is seen best with binoculars, resembling a hazy thumbprint the size of the Moon or larger. You might see the odd shooting star emanating from the handle of the Big Dipper this weekend as the minor Ursid meteor shower peaks on Saturday evening. The bright full Moon will be doing its best to hide them, however.